The United Stated Mexico Canada Agreement (USMCA), which must still be approved by Congress, is mostly the same as the old agreement, but don’t call it NAFTA 2.0. The agreement should not have much of an impact on overall economic growth or inflation, but it is a hurdle cleared. 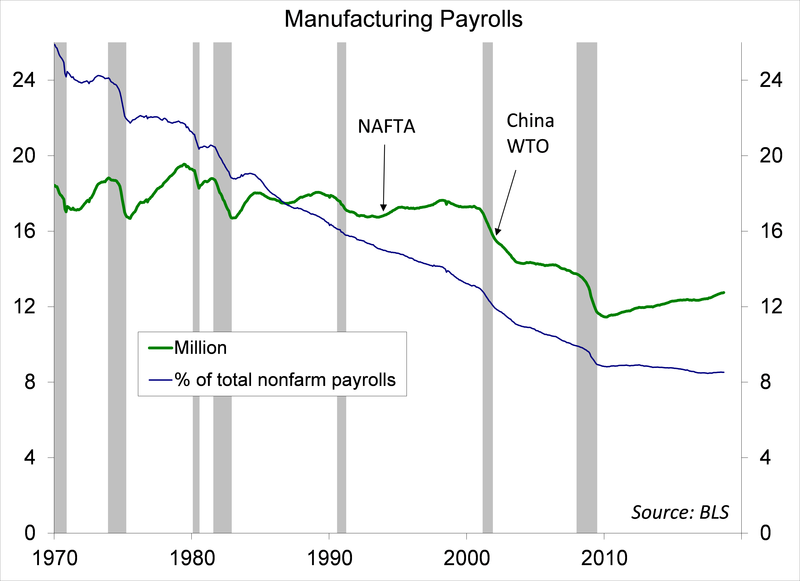 That is, letting NAFTA expire would have been disruptive to manufacturing supply chains, especially in motor vehicle production. With the midterm elections approaching, it made sense to declare victory and move on. The September Employment Report was subject to hurricane and seasonal adjustment distortions, but details were consistent with strong growth, tighter job market conditions, and a further gradual path of Federal Reserve interest rate increases. Bond yields finally moved higher, adding some anxiety for the stock market. The USMCA specifies that, to avoid a 2.5% tariff, 75% of the content of imported vehicles must be from North America (vs. 62.5% in NAFTA). In addition, 70% of the steel and aluminum must be produced in North American, and 40% of the vehicle must be made by workers earnings at least $16 per hour. Carmakers may opt to avoid the added costs and hassle of complying with these rules and simply pay the 2.5% tariff. However, President Trump has threatened to invoke Section 232 tariffs (“national security” concerns) to boost tariffs on imported vehicles. Either way, consumers will pay more. USMCA calls for an additional 0.35% expansion into the Canadian dairy market (from 3.25% to 3.6%). There are other elements, but most of the USMCA is exactly the same as in NAFTA, leading some critics to describe it as NAFTA 0.8 (as trade is a little less free relative to the previous agreement). Nonfarm payrolls rose less than expected in the initial estimate for September, but with an upward revision to the two previous months. The unemployment rate fell to 3.7% – the lowest since 1969. Average hourly earnings rose 2.8% y/y. Hurricane Florence and the usual seasonal noise around the start of the school year may have distorted the September figures. However, the details were consistent with a further tightening in labor market conditions, as reflected in much of the anecdotal evidence cited by firms. Speaking to the National Association for Business Economics, Fed Chairman Powell spoke optimistically about the economy (as he did in his post-FOMC press conference) and provided further insight into the central bank’s current thinking on monetary policy. The Fed still embraces the Phillips curve, the tradeoff between the unemployment rate and inflation, but believes that anchoring of inflation expectations has flattened it. Officials see three key risks. The first is the inflation expectations could become unanchored, but there is little evidence of that currently. 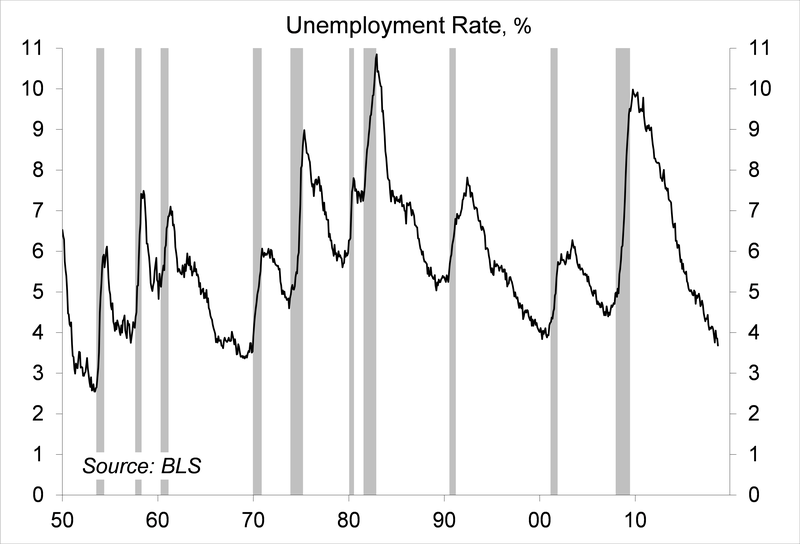 The second is that the slope of the Phillips curve may be a lot steeper the further the unemployment rate falls below the natural rate (Powell calls this “the revenge of the Phillips curve” scenario). The third risk is that the natural rate of unemployment may be a lot lower than is currently thought. Fed officials generally expect the unemployment rate to fall to 3.5% in 2019 and 2020 without much of an increase in inflation, before starting to move back to its long-term natural rate (4.0-4.5%) in 2021. Powell said that the Fed’s gradual pace of interest rate increases is appropriate as it seeks to balance these risks. Investors should keep an eye on inflation expectations and on whether firms can pass along higher labor costs. Strong economic growth, tighter monetary policy, and a sharp increase in government borrowing each puts upward pressure on bond yields. However, longer-term interest rates have (until recently) remained low abroad, constraining yields here. Share prices can be thought of as a risk-adjusted discounted stream of future earnings. Hence, all else equal, higher long-term interest rates imply a greater discounting and lower share prices. Of course, all else is never equal. Earnings will remain the key driver. However, movements in long-term interest rates can be expected to add some noise for the stock market in the weeks and months ahead.